A smart looking diaper bag for daddy and mummy! very big open conpartment, water resistant in Light ..
Package Included: 1 x Mummy Bag(With Changing Pad) Colors:Black,Grey Material:Polyester L.. This smart creation makes it easy for you, a mother and full-time organizer, to have easy access to .. 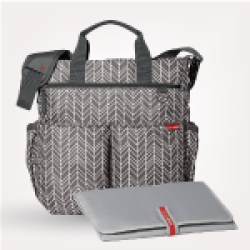 Ideal for the parent wanting class and elegance from a diaper bag. Offering form and function. Pu..
For the Stylish and Traveller Mom's, this choice is the best. This GenioWorld diaper bag comes with .. Carry handles as well as a removable shoulder strap providing different carrying options Spacio..
Large main compartment with 5 pouches including two insulated ones for keeping items warm or cool.. Slim line messenger design changing bag with a suitcase strap Ample zipper compartments on the .. Carry handles can be fastened together suitcase strap when travelling 100% waterproof material ..
Color: Gray New Feature : Built in USB Port Material: Polyester Size: L32xW16xH39cm Inclu..
Color: Black New Feature : Built in USB Port Material: Polyester Size: L32xW16xH39cm Incl.. This colorland diaper bag is designed to be a backpack. For the convenience of Father-Mother who lik..
Color: Grey Material: Polyester Size: L43xW20xH38cm Inclusion: Changing MatFeatures: ..
Color: Blue Material: Polyester Size: L43xW20xH38cm Inclusion: Changing MatFeatures: ..
Light gray women's handbag. It has two large pockets, and especially mothers appreciate the w.. The Casual Hobo Bag is a fashionable diaper bag and a very practical companion. The bag has two open..
one large well-organised compartment with lots of elasticised pockets large zipper pocket in fr..
two large main compartments, water-repellent changing mat insulated, removable bottle holder, z.. Style: TOTE BAG, TOTE ,SHOULDER ,TRAVEL BAG Size: Medium(30-50cm) Material: Polyester Place..
Colorland Leather Full Featured Tote Diaper Bag With Changing MatIdeal for the parent wanting cl..
Name: Multifunctional mummy bag Fabric: PU Lining: 100% polyester Weight: 0.94k.. Stylish and pragmatic this darling leather tote bag is the perfect accessory for you and your baby. .. Ideal for the parent wanting class and elegance from a diaper bag. Offering form and function. Pushc.. This Colorland Tote Bag can be hand carried, carried on the shoulder and can also be carried messeng..